Do you have an idea of how well known you are in your market relative to your competition? Do you lead the pack in terms of recognition? Somewhere in the middle? Or trailing behind? An important objective of any marketing strategy is securing your spot in your marketplace. You can learn a lot about your place in your market by looking at your competition. A little research will give you some valuable insight on where your stand and how you can improve your marketing efforts. What social media platforms are they on – You can get a good idea of who your competitors are targeting by looking at the social media platforms they are publishing content to. For instance if they are active on LinkedIn, then they are most likely targeting B2B clients. If they are on Snapchat or Instagram, then they are most likely targeting a younger audience. In any case, you will get some insight into the types of customers your competitors are going after. This could open up some opportunities to target an underserved segment of the population or it can give you new ideas on how to target the same audience. What sorts of content do they publish – While you are reviewing the social media profiles of your competitors, take a look at the types of content they are sharing. Are they posting links to blogs or videos or photo-based images? Be mindful of the subject of the content and what seems to be getting more engagement. Knowing what types of content is popular and the topics that are most popular should key you into the content you should be sharing. Sign up for their email list – Another way to get a glimpse into what your competitors are doing is to sign up for their email list. Again, look at the types of content and the topics they are covering. This can lead to another opportunity if your competitors are covering a certain topic enough or in the right way. Frequency of posting or emails – As you study their email and social media tendencies make sure you take note of how often they are sending emails or sharing content. It is not competition in terms of having to send/publish more or less content. However part of a successful marketing campaign is being able to stay top of mind of your target audience at the time they may need your service. If the only voices are coming from your competitors, then you will lose by default. It is tough balancing quantity with quality, however it can be done. Conduct a survey of your current clients – This last one is not for your competitors, but rather your current loyal customers. Conduct a survey to see what first attracted them to your organization and what keeps them coming back. This information, combined with the information from your competitor marketing analysis, will you a great start on creating the content needed for your marketing strategy. To quote Sir Francis Bacon, “Knowledge is power.”. In this case knowledge will give you the power to better compete in your market and industry. Understanding how your local and national competitors are trying to engage with the same people you are targeting will give you the power to take advantage of opportunities and potentially avoid wasteful and ineffective marketing activities. Ignoring your competitors could leave you powerless. Want to know your competition better? 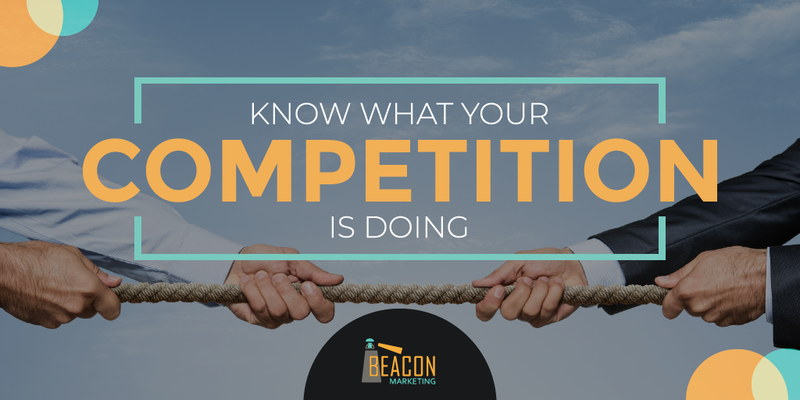 Beacon Marketing has developed a guide which not only helps you analyze your competition, but walks you through developing an entire custom marketing strategy designed to meet the unique needs of your business. The Definitive Marketing Strategy Guide by Beacon Marketing is the marketing solution you have been looking for! For more information click here!.